A downwards swing was expected, but it was much more shallow than the target. A pullback continued as expected from last analysis. An upwards swing was expected but did not happen. Stops should have been set just above 16.726. If they were set, they were triggered on the 23rd of June closing short positions for a profit. Summary: Silver is range bound with support about 16.05 – 15.70 and resistance about 18.55 – 18.65. Currently, it looks like a downwards swing has ended and an upwards swing is in its early stage. Last monthly chart is here. 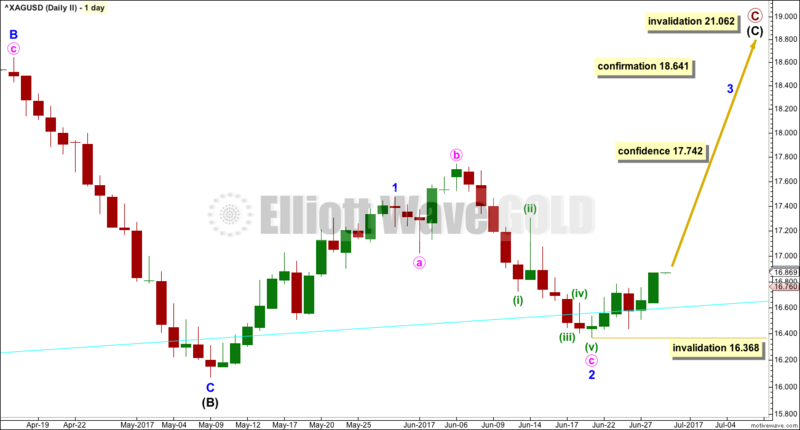 Cycle wave b may be completing as a double combination: zigzag – X – flat. The second structure, a flat correction for primary wave Y, may be underway. Within a flat correction, intermediate wave (B) must retrace a minimum 0.9 length of intermediate wave (A) at 15.938. The common range for intermediate wave (B) is from 1 to 1.38 the length of intermediate wave (A). The target calculated would see intermediate wave (B) reach to within the common range and pass its minimum requirement. If minor wave B moves any higher, then the target for intermediate wave (B) must also move correspondingly higher. Intermediate wave (B) may make a new price extreme beyond the start of intermediate wave (A), as in an expanded flat, which are very common structures. The bigger picture for cycle wave b would expect primary wave Y to end about the same level as primary wave W about 21.062. The purpose of combinations is to take up time and move price sideways. To achieve this purpose the second structure in the double normally ends about the same level as the first. The maximum number of corrective structures is three within combinations (and multiple zigzags). This maximum applies to sub-waves W, Y and Z. Within these structures, they may only be labelled as simple A-B-C corrections (or A-B-C-D-E in the case of triangles). They may not themselves be labeled multiples as that would increase the number of corrections within the structure beyond three and violate the rule. X waves are joining structures and they are not counted in the maximum total of three (otherwise the maximum would be five). X waves may be any corrective structure, including multiples. 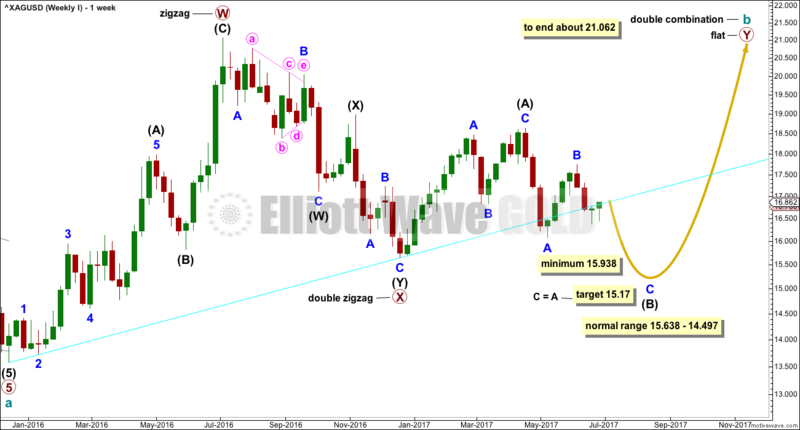 While the combination wave count at the weekly chart level does not currently work for Gold, it does still work for Silver. They do not have to complete the same structures for cycle wave b, and fairly often their structures are different. A strong breach of the channel drawn in last analysis began on the 23rd of June and indicated that the last wave down for minute wave i was over. Minute wave ii may now also be over, or it may continue further sideways or higher. If it does continue higher, it should find strong resistance at the upper edge of the Elliott channel. 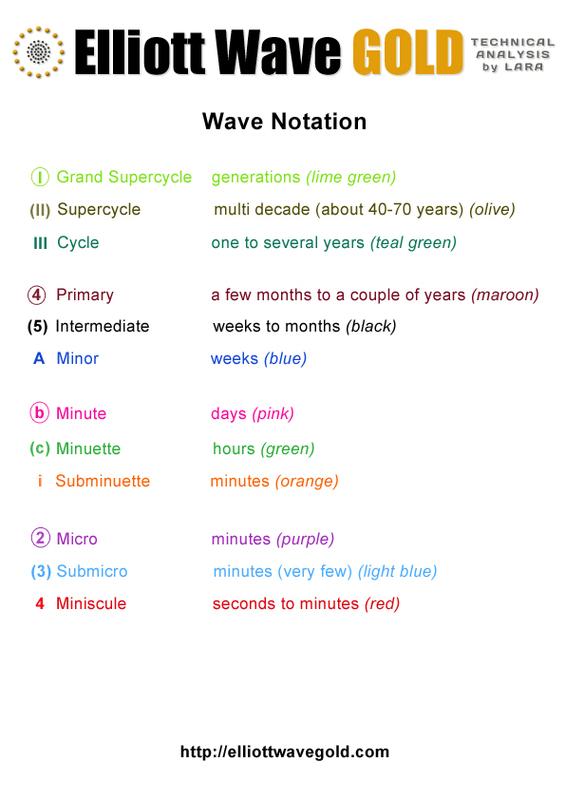 When minute wave ii is complete, then downwards movement should show an increase in momentum for minute wave iii. Minute wave ii may not move beyond the start of minute wave i above 17.742. It is also possible that cycle wave b may be completing as a triangle. Mostly because combinations are more common than triangles is this a second wave count. Within a triangle, only one of the sub-waves may be a more complicated multiple. Primary wave B subdivides as a double zigzag. Primary waves C, D and E may only be single threes. Within a contracting or barrier triangle, primary wave C may not move beyond the end of primary wave A above 21.062. To label primary wave C over at the last high of the 17th of April would see the A-C trend line too steeply sloped to have a normal look. It would be only a 0.55 length of primary wave B, which is unusually short for a triangle sub-wave. It would look more likely that primary wave C is not over. Within a contracting triangle, primary wave D (nor any part of primary wave C) may not move beyond the end of primary wave B below 15.638. Within a barrier triangle, primary wave D should end about the same point as primary wave B. As long as the B-D trend line remains essentially flat the triangle will remain valid. In practice, this means that primary wave D may move slightly below the end of primary wave B (this is the only Elliott wave rule which is not black and white). The final wave of primary wave E may not move beyond the end of primary wave C. It would most likely fall short of the A-C trend line. This second wave count expects a large consolidation to continue for months. Primary wave C may be an incomplete zigzag. A new high above 18.641 would at this stage invalidate the first wave count and provide some confirmation of this second wave count. Minor wave 2 may now be complete. Minor wave 3 may be underway. This second wave count does not have support from this week’s classic technical analysis, so it is less likely than the first wave count. 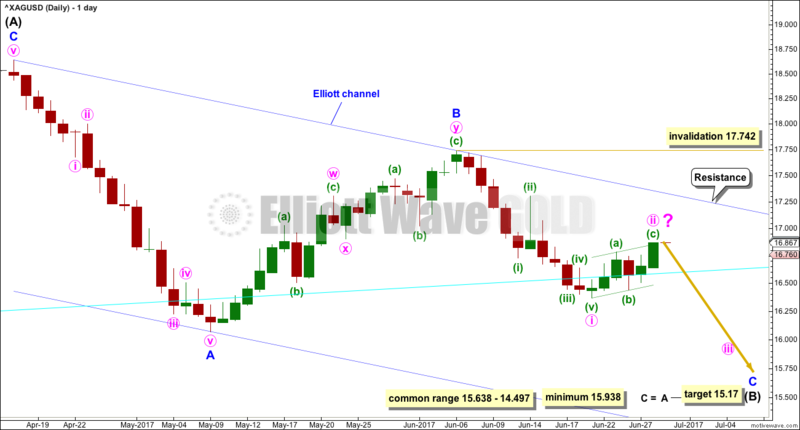 Within minor wave 3, no second wave correction may move beyond its start below 16.368. Volume now suggests a downwards breakout from the trading range is more likely than upwards. 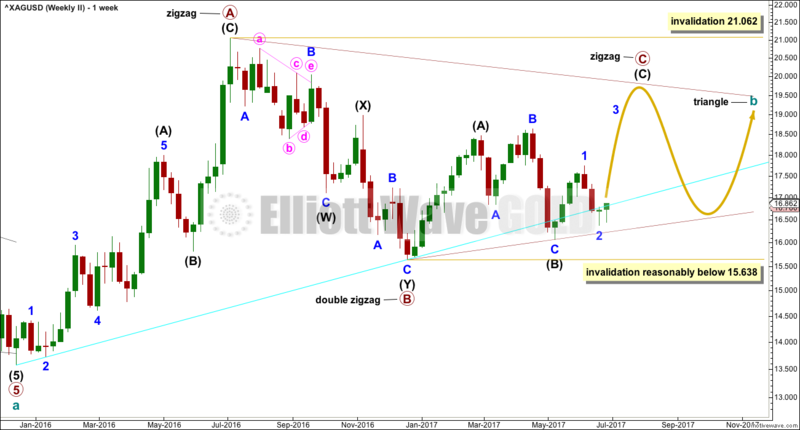 Overall, Silver is in a large consolidation at the weekly chart level. Support is about 16.05 – 15.70 and resistance is about 18.55 – 18.65. ADX agrees that price is consolidating. The long lower wick on the last completed weekly candlestick is bullish. The last downwards swing within the consolidation now looks likely to be over, so an upwards swing may now be in its early stages and may last a few weeks. 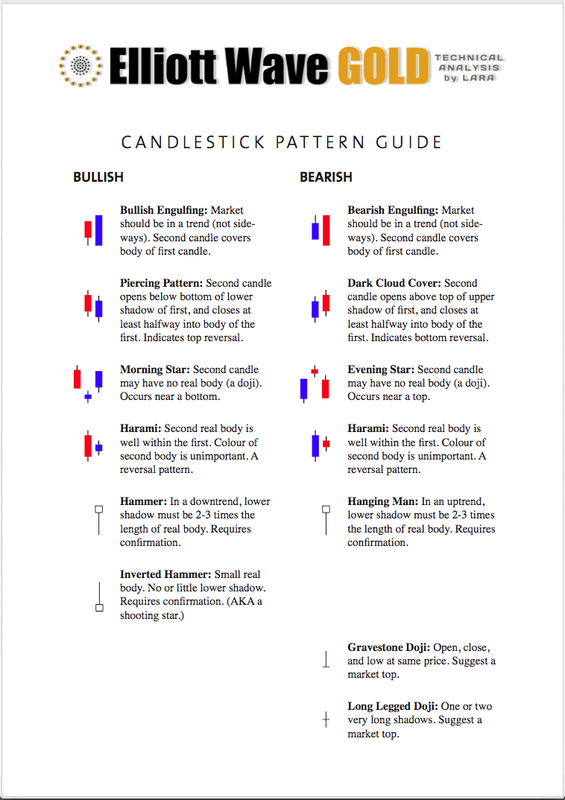 The very long lower wick on the candlestick for the 26th of June is very bullish; it completed a Hammer candlestick reversal pattern. It looks like a low is in place at least short term. Volume is not at this time supporting upwards movement. 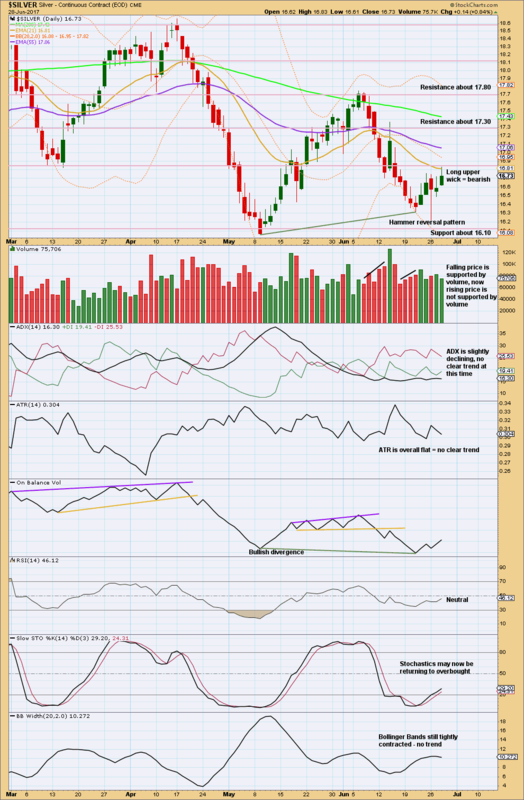 That may change but for now this should be read as bearish. The long upper wick on the last daily candlestick is bearish for the short term. 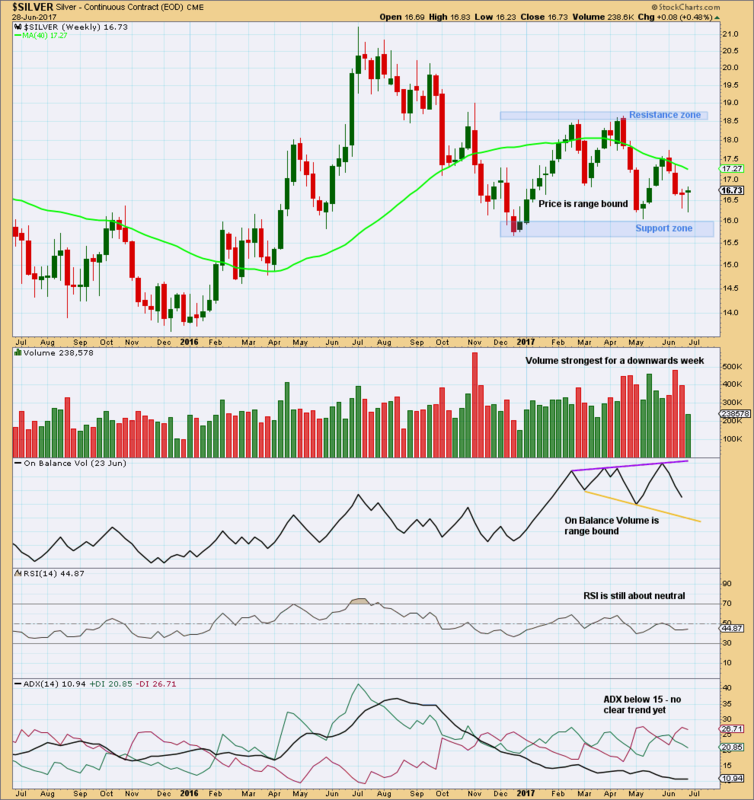 Look for a red daily candlestick for Silver tomorrow. This analysis is published @ 01:33 a.m. EST. Last analysis expected downwards movement, which is what has happened. Members who took last week’s trading advice to enter short on the bounce of the 14th of June should now have profitable positions. Advice is given this week on how to manage those profitable positions.